So I’m a chronic blog reader. A confession, maybe. All I know is that I’m not alone. I read blogs about parenting to crafting to food to decorating. All which provide me with overwhelming inspiration which then gets projected onto my dear sweet husband who takes it all in stride and knows that it may or may not be a short lived idea. I get replies like “yeah, looks nice” or “you’re just going to have to do it” when I show him a bright white kitchen (a far cry from our honey colored cabinets, freckled countertops and black appliances) or a lively living room with a red couch and a fun rug. So with all the beautiful spaces from all over the country, large homes, rental spaces, a lushes backyard, I’ve been struggling to find my design style. I love taking something from a space and putting it in my own, but it doesn’t all go with our current furniture, feel of our home or us for that matter or a wall color that we don’t plan on changing for awhile. I love the bright colors, I love the pure-ness of white, I love the rustic feel of wooden beams, I love simplicity. So where does that leave me? Looking to my roots. 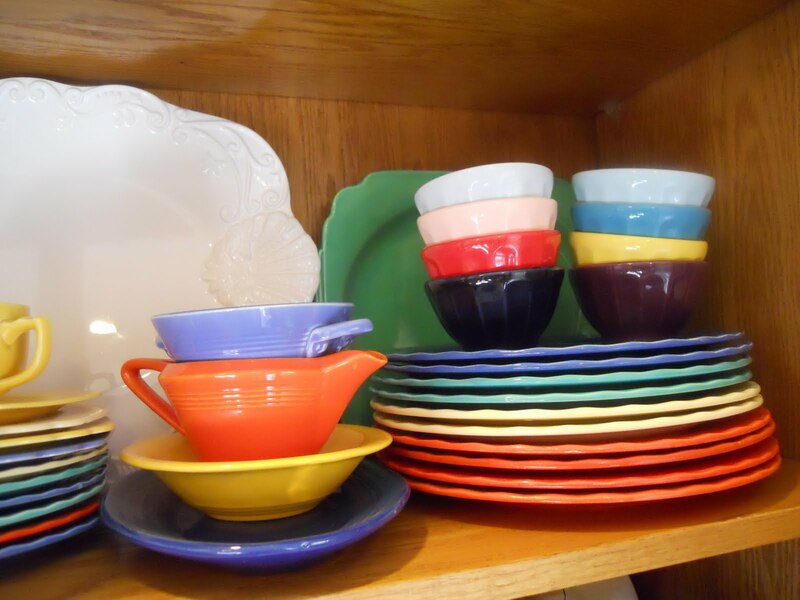 My mom was an avid antiquer finding old crocks to hold wooden spoons, ball jars to hold spools of thread, beautiful Harlequin dishes in mint condition, old grates to adorn the walls. All to which at a young age, didn’t appreciate very much. I would be “dragged” into antique shops on the hunt for the cup that wasn’t on the list which have all become fond memories of my growing up. My mom’s style was at the time considered plain old country with all the blues, roses, small prints – nothing that I liked as my room was black and white (with pink carpet but we won’t talk about that). But after my mom’s passing, I found myself fawning over the 40’s fabrics she has chosen for various quilts, the numerous Ball jars, the small spice cabinets, the old tin cans containing hair tar (or something like that). I kept a box or two of the above items, never really knowing what I’d do with them seeing as I had a modern taste (or so I thought) but couldn’t part with them. Which leads me to my current project, a slow and steady one as are most projects in our house, our bedroom. It’s on the smallish side with a small walk-in closet and a bathroom but it does the job as we don’t spend a lot of non-sleeping time in there (aside from Saturday morning Mickey Mouse and Jake & the Neverland Pirates watching). We have a lovely bedroom set that we impulsed purchased after eating Chinese in our pre-children days. We still like it and plan on keeping it around awhile. It’s a espresso brown with an X pattern and raised silver blocks on the headboard and one dresser. 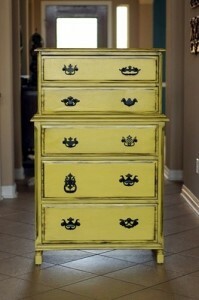 It’s a bit matchy matchy to what my blogs show me but painting furniture scares Gary a bit. The wall color is the builder color, a nice tan actually, but I’m ready for a little lighter, fresher tan of sorts. I was trying to figure out how to do a grey wall color for the longest time but I couldn’t get a nice shade that would work with the furniture and our brown bathroom (that is liked and took 3 coats, so it’s staying). I waved the white flag to the wall color and realized that other elements I’ve made or purchased were leaning towards the antique feel instead of this modern edge I’d been trying to create. Do you ever try to work in a new trend or style just because? Ever impulse something as large as bedroom outfit after Chinese?